It is white Christian Terrorism, not only Islamic Terrorism ! Edward Said’s observations in his published prominent work Orientalism, in which he, among other things, exposed and criticized western inaccurate attitudes and portrayals of Orient cultures including Muslims were accurate, as we are witnessing intensive process by the West to dehumanize Muslims believing that their religion of Islam is inferior, savage and irrational system of beliefs. To the Western media, terrorism implicates only Islam and every Muslim is suspect of terrorism until proven innocent. This has overlooked the reality that terrorism does not belong to any religion and that those who commit terrorism are criminals regardless of their religion, race or colour . The Western Media is the one that intentionally overlooks to associate terrorism with those white Christian killers of the far right, including Darren Osborne, who attacked London’s Finsbury Park mosque in 2017, killing a worshipper; Dylann Roof, who gunned down nine African-Americans churchgoers in Charleston; and, inevitably, the Norwegian mass murderer Anders Breivik. Those attacks committed by members of those white Christian far right groups are treated as kind of handful of sad loners, oddballs or psychopaths who lacked preventive medical care before they acted. For this reason, such media never mourn for killing Muslims nor humanize their sufferings. The overlooked Christian terrorism has now advanced in many European countries under the pretext of preventing a great replacement against European race on their land as put in the manifesto written by the white Christian Australian terrorist who killed 51 Muslims at prayer in two mosques in Christchurch, New Zealand on last Friday. With the horrific nature of the attack, many Muslims waited to hear the kind of characterization, the media or the Western politicians will give the attack. As expected, it took hours for the New Zealand prime minister to characterize the attacker as “terrorist” and because in the first hours she was characterizing the attack as an extraordinary and unprecedented act of violence with no referring it as terror attack. Muslims in the world have at least appreciated to hear such unprecedented characterization of the attack by the New Zealandia prime minister because they have never used to hear such word when they are killed by the Christian terrorists even though this horrific attack has not yet been associated with Christianity as Western politicians do when such an attack is executed by alleged Islamic Jihadists whose race, origins, and religion make immediate headlines. 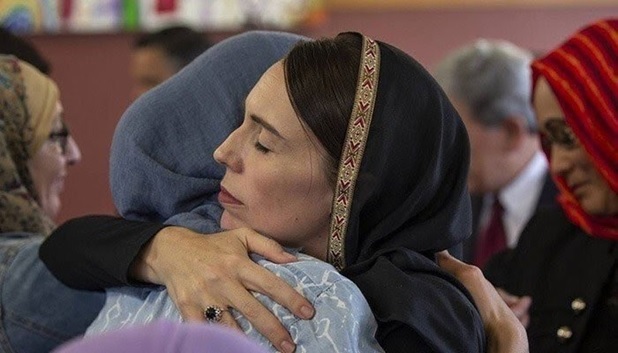 With all great sympathy and support accorded by the New Zealand prime minister to her Muslim community from characterizing the attack as terrorism , covering her head during her visit to the families of martyrs to show respect for them , sponsoring all funeral expenses of the martyrs to sponsoring dependents of the martyrs , I am still hesitating to accept that the New Zealand prime minister would have branded the attack as terrorism but for the reality that the man suspected of the attack could not have been clearer. He literally spelled out his meaning in words and slogans daubed over the murder weapon itself, with his manifesto, published online leaving no room for speculations . New Zealand PM visits grieving Muslim families, wearing hijab as a sign of respect. I do not advocate, of course, to associate terrorism with any religion including Christianity, however, the media and politicians in the West ought to follow uniform in the use of words when describing politically, racially, and religiously charged situations and tragedies. It is a premeditated hypocrisy to become common among the Western media to refer perpetrators of a terror attack to Islam or Muslims only when the perpetrator is allegedly a Muslim spending a lot of air time and holding debates about the dangers of Islam with the aim to sensationalize primetime shows by giving space far-right analysists to vomit their bigotry and hatred against Muslim minorities in the West in particular and Muslims in general . The West needs first to brand white Christian terrorism in the same way they do with their Muslim terrorist counterparts. This is the only objective framing of words and actions that could be acceptable to us as Muslims, otherwise, the Western media and politics are premised in large part upon prejudices against Islam and Muslims. Secondly, the West should control the danger that is being presented by the far right political parties who are gaining growing foothold in the politics more than one European country , namely Hungary, Italy, Australia , Sweden, Austria and Germany . These far-right populist politicians are not less danger than Bin Laden of Al-qa’ida or Al-Baghdadi of ISIS. These far right politicians believe that Europe or the West is under great replacement as result of growing Muslim refugees immigration as coined by Donald Trump in his 2017 speech in Warsaw the 2017 asking participants “Do we have the desire and the courage to preserve our civilization in the face of those who would subvert and destroy it?” . Similar position was echoed by Viktor Orbán, prime minister of Hungary, who repeatedly consider himself as the defender of a Christian European civilisation under mortal threat from Muslim immigration. Do not forget also Matteo Salvini in Italy, who argued “I don’t want to end up like Great Britain, which has Islamic courts instead of British courts.” These Islamophobic rehetorics by some Western leaders, who are depicting their own Christendom, have inspired many white Christian monsters including the latest Christchurch killer as he put in his 74 page manifesto by saying “ Europe is for Europeans . The invaders (Muslims) must be removed from European soil, regardless from where they came or when they came”. As there can be no defense for the terrorism and despicable brutalities perpetrated by the al-Qaeda, Boko Haram and ISIS and their likes, no justification or defense should be accorded to the terrorism and brutalities perpetrated by the Christian white far right groups in the West. The solution is not providing fertile ground for Islamophobic, rather, it is the interest of the global peace and security to fight growing Islamophobic culture that makes it easier for white extremists to think that they are legitimized to accomplish their deadly fantasies. Muslims face dual threats: white Christian far right terrorism and terrorism of that so-called Muslim Jihadists. The second one is fought unanimously by the World and is rejected by Muslims while the first one enjoys protection , support and sometimes reward by giving them space to lead their respective Western states.